Alice is an aspiring pop star. 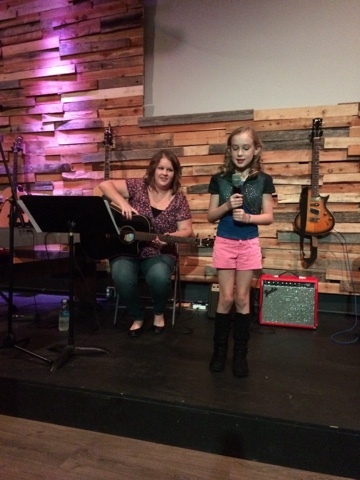 She has been taking voice and guitar (to a lesser extent) lessons since the beginning of the year. Alice participated in her first recital with the school. She was nervous but excited. Didi and Pop came down from Dallas to watch. 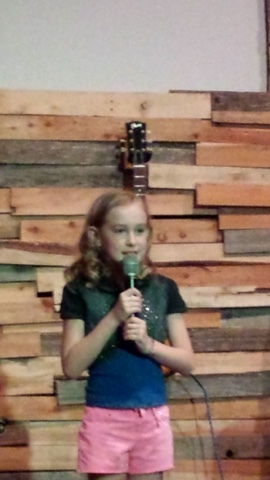 With Her teacher Ms Tracy accompanying her on guitar, Alice rocked the house singing Taylor Swifts Shake It Off. There was a small snafu in the performance where Ms Tracy stopped the song short of the rap.....the most fun part of the song. Alice turned to her and let her know she was not finished and her Dad almost jumped up to cry out 'what about the rap!' Ms Tracy laughed and accepted her mistake and the song continued this time with audience clapping. This seemed to relax Alice and she nailed the rap and end of the song. I think the recital got Alice more excited about performing. She said she has already picked her next song and began practicing it the same weekend.